Following the DBA progress criticism on wednesday my group was still in the process of choosing a logo to represent the campaign. 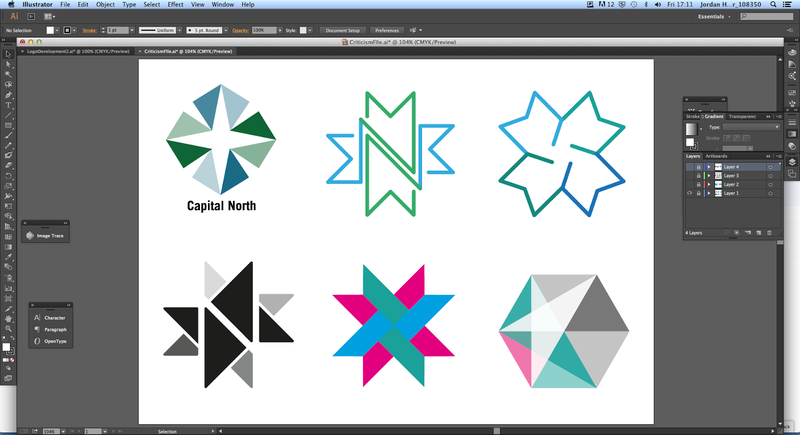 After receiving feedback that suggested we should continue with the project by developing a range of logo variations based on James' North Star design, the group split up to individually work on a range of outcomes. On Friday, we regrouped with the logo variations produced over the two day period to have a final logo focused criticism, the overarching aim of which was to choose a final design. Initially, following the same criticism structure that was used in our previous sessions, members of the group had around five minutes to present their designs, during which the additional members of the group helped to choose the strongest designs. 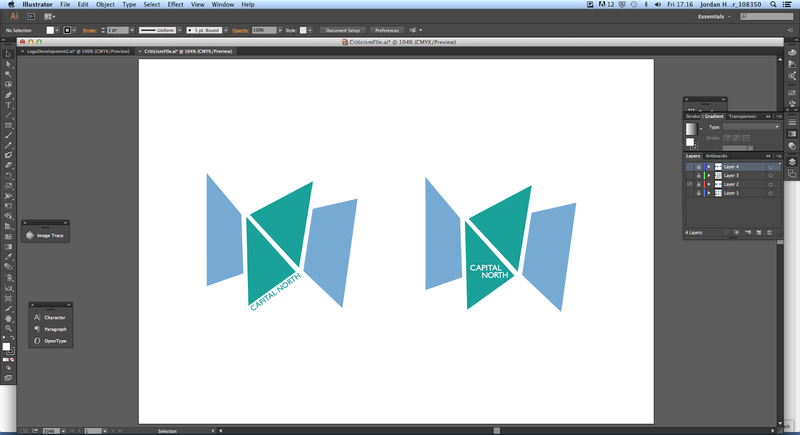 One to two designs were picked from each persons responses forming the final selection of logos designs. Again, this was a tough process as a lot of the outcomes had relevance to the campaign and were visually strong. To help us decide which logo to progress with the designs were printed onto A3 sheets allowing us to see them in printed form. As we had not yet defined a colour scheme, and because some designs were produced in black and white, the responses were printed in greyscale to ensure the final choice was not influenced by aesthetic aspects that will at some point be changed. To speed up the decision making process we devised a quick point based system to help identify the strongest logos. Using strips torn from a post-it note each member of the group had two votes they could use to define their favourite designs. Luckily, there was an odd number of group members ensuring that a winner could be selected. From the selection of final designs, James' new variation of his North Star logo was selected using the vote based system, a decision which all group members were unanimous on. Personally, I believe that using the voting system was a good way to choose the final design as it gave people the freedom to select their favourite outcome without the drawn out process of justifying their decision. Undoubtedly, because of its immediate success, I plan to use the technique in future collaborations when group decisions are becoming drawn out and prolonged. 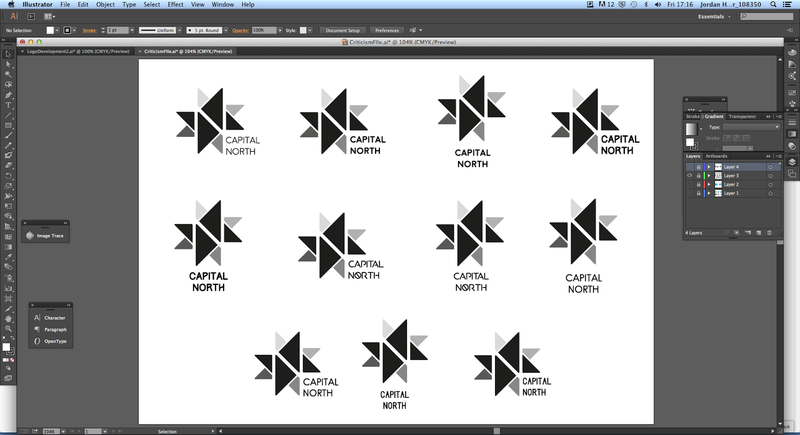 North star has relevance to the Capital North campaign. Logo creates an N with negative space. The negative space N could be utilised as a secondary campaign logo. The negative space N could be used for smaller logo applications as it will retain legibility at tiny sizes. Can be broken down into individual pieces and rearranged to create new forms - Forms could represent individual cities. Logo is formed from triangles, a shape that can tesselate and and be used to create a range of visuals for the campaigns identity. After we had selected a final logo icon, we decided to progress with the project by starting to think about the supporting design decisions which will help to form a recognisable campaign identity. As we only had half an hour before our session time was over we decided to individually collect a range of typefaces we believed could be used as the main display typeface for the project. When choosing my set of typefaces I looked for a definitive set of attributes which I have listed below. Sans serif typefaces - not too formal. Rounded caps - Similar to rounded corners of logo icon. Sans serif - Friendly, approachable appearance, bridges the gap between outlined audiences. Unfortunately, before the session finished we did not have time to choose a typeface. However, this could have been a good thing as the font choice that is used as part of the campaign should be carefully selected to ensure it contributes to the aesthetic and overarching identity we want to develop. The main outcome of the session was the selection of a final logo icon, a decision which the group had been battling with throughout the past week. As we now had an icon to represent our campaign we decided to split the workload so we could progress with the project and start developing the additional visual elements that are part of the listed project outcomes. Two of the group members started working on refining the logo and experimenting with different typefaces so that by monday of next week we could have a final logo design consisting of two main visual elements, the secondary icon and a typeface portraying the name of the campaign. Other members of the group were tasked with developing concepts and rough visuals for the four posters that we are required to create as part of the project.